With a "lush and lyrical voice" (Boston Globe) acclaimed singer Jinny Sagorin delivers exquisite and heartfelt renditions of cabaret, musical theatre, pop/rock, South African contemporary and traditional songs, and select gems from the American Songbook. Sagorin has a lush, lyrical voice, and a disarming sincerity. Sagorin is a unique soulstress with a rich repertoire...She delivers her lush sounds with the purity of a songbird. "It's For You" boasts dynamic renditions...Freddie Mercury's 'Love of my Life' ought to be an instant favorite...the most haunting and memorable is the Heymann-Fox-Cohen collaboration, 'Weeping'. Jinny Sagorin possesses a beautiful voice. She does 'Love of my Life'; one of Queen's most gorgeous, swelling, sad songs...that's where Sagorin is at home. Should be an emotionally rich evening. 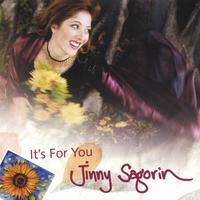 "It's For You" is filled with warmly sung and very tasty pop, jazz and traditional folk tunes. Jinny Sagorin has enormous ability and a truly wonderful voice. Critically acclaimed musical theater and cabaret veteran JINNY SAGORIN was born in Durban in the province of KwaZulu-Natal, South Africa. Sagorin has worked as a singer, actor, artist, television presenter and writer. She performed with the national theatre companies in Cape Town and Durban. Favorite productions include FIDDLER ON THE ROOF, THE SOUND OF MUSIC, HAIR, EVITA, NAUGHTY NOEL, THE STUDENT PRINCE, INTO THE WOODS, ANNIE, and JESUS CHRIST SUPERSTAR. She has starred in cabaret/revues - SWINGERS, HOW LUCKY CAN YOU GET, ASPECTS OF RICE & WEBBER - and has sung in various groups, from a cappella to a rock and soul band, from folk duos to performing with the Cape Town Symphony Choir. In Boston her musical theater credits include leading roles in 1776 and THE PIRATES OF PENZANCE, and with Overture Productions' THE BAKER'S WIFE with Judy Kuhn. In 2003 Jinny Sagorin was one of thirty-six performers selected out of nation-wide auditions to attend the first Cabaret Conference at Yale University. Since moving to Boston, Sagorin has become a regular on the cabaret scene, performing at Club Café, Regattabar, Encore, The Center for Arts in Natick, Blacksmith House, Java Jim's, as well as singing at private and corporate functions. She made her debut at Scullers Jazz Club in February 2005 with a sold-out performance of her show, "IT'S FOR YOU" which launched her first solo CD. Jinny has been featured in the Boston Globe, New England Entertainment Digest, Bay Windows, The Jewish Advocate, and the Newton Tab. She appeared on Channel 7 WHDH, was featured on WNTN's '1550 Today', and has been the guest of Jordan Rich in a live broadcast of The Jordan Rich Show on WBZ NewsRadio. Sagorin served on the board of directors of the Boston Association of Cabaret Artists (BACA) for two years and was Vice-President of the organization from 2003-2004. "Jinny has the rare vocal gifts of earthy grace and unearthly poetic beauty in her sound and in her presence. She will touch your heart." I bought this cd a few weeks ago and it is already my favorite! I cannot get stop listening to it. Jinny's voice is as smooth as silk and each word is filled with compassion. If you buy this cd you will not be disappointed!!! Enjoy! 'It's For You' will both enthrall and move you!The artist's selection of songs is an eclectic but captivating combination of the known and the exotic, which tells the story of her life in song. One is mesmerized from the start, because there is a constant rush of invention - ample testimony to the singer's art and imagination. Her intimate enunciation of the lyrics is exceptional; I felt that I was hearing the songs for the first time. Vocally, Sagorin boasts a rich coloristic palette, and her performance on this remarkable new CD is characterized by a sophisticated elegance, warm humor, and a subtle passion. It will go straight to your heart! Jinny's rich voice shines with sincerity in this delightful selection. A 'must buy'. A gift of beautiful songs sung with so much heart. It's mesmerizing. From start to finish one is transported to a different time and space realm into a dream world of peace, warmth and harmony. Sagorin's voice, with its incredible crystal clarity, fills every word and every note with so much emotional depth and soul. In this seamlessly smooth production, Doug Hammer has created a fabulous backdrop of musical arrangements that blend into one magical sound with Jinny's beautiful vocals and harmonies. We can hear her heart in every carefully chosen song. Jinny is a wonderful performer and genuinely nice person. She has the ability to make old material sound fresh and new with her style, grace and passion. Her voice is entrancing and Doug Hammer was able to exquisitely catch it on CD for us all. Jinny's voice is so rich. I love the way she uses her range as though she is playing with the words and the sounds -- liltingly. Every time I listen to her singing, I hear new depth and nuance.